Accor – Newsroom | Journey into the sublime at Raffles Hotels & Resorts. Journey into the sublime at Raffles Hotels & Resorts. East meets west in the Indonesian Heritage Experience at Raffles Jakarta. Spa goers will sample traditional Indonesian rituals applied to modern head-to-toe treatments. The journey begins with the feet: a soothing footbath and a Raffles Signature foot massage. The body is softly exfoliated with an anise scrub, used for its health and aromatherapy benefits, and prepared for the ultimate Indonesian Heritage massage. This unique all-over treatment combines Lomi Lomi, Balinese and Javanese massage techniques. Finishing at the top, a relaxing head and scalp massage completes 150 minutes of pure bliss. Spice it up at Raffles Grand Hotel d’Angkor, Siem Reap with the Traditional Khmer Herbal Wrap. A spicy healing pack is prepared using a combination of roots, herbs and spices, including genuine Khmer Herbs originating from Cambodia. Precious herbs such as galangal, ginger, cinnamon and lemongrass are mixed into heated herbal compresses for the body to relieve stress, boost energy and detoxify the cells. The treatment is completed with a moisturizing cream and a full body massage. 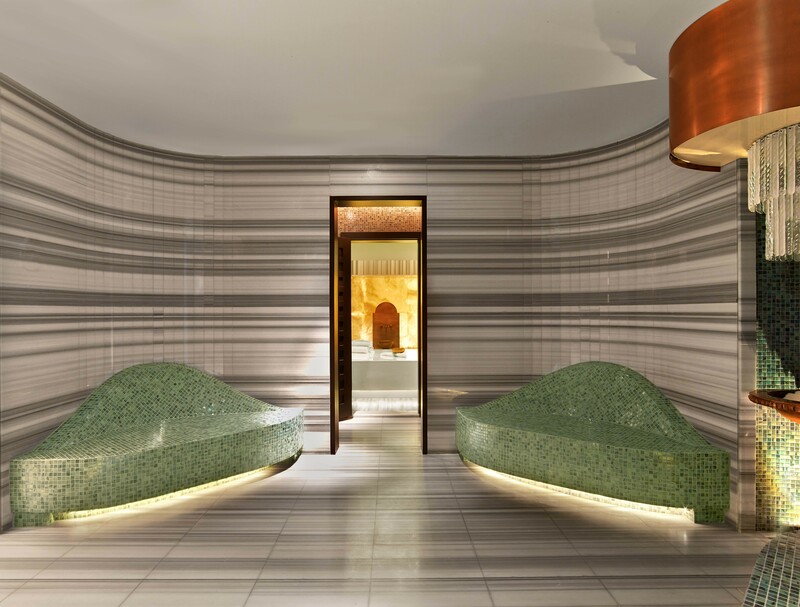 Unleash one’s inner Cleopatra with the golden secret to beautiful skin at Raffles Dubai. Guests will discover one of the world’s most luxurious spa experiences: The Egyptian Gold Facial. Ultimate decadence begins with 24-carat golden leaf sheets applied to the skin using the latest spa technologies. Perfect for all skin types, the Egyptian Gold Facial consists of six segmented procedures including a thorough cleanse, refined scrub, uplifting face massage, rejuvenating golden facial, calming steam and moisturizing Chitosan mask. The result is a radiant, youthful, glowing complexion, worthy of an Egyptian queen. The ever-so cosmopolitan Raffles Istanbul offers guests a truly authentic Turkish experience with the Anatolian Grace Hamam Journey. The experience is a traditional Hamam with essences of lavender or rose, incorporating locally inspired ingredients of organic lavender, infused honey and milk. This authentic cleansing ritual of 120 minutes begins with the gentle heat of the steam and stone to soften and prepare the skin for exfoliation, using a scrub and traditional kese mitt. The face and body are then replenished and restored with a hydrating body mask, leaving the body radiantly refreshed and smooth. This authentic Hamam treatment continues with a relaxing 15 minute tea ceremony and a full body massage using warmed nourishing oils. Designed exclusively for guests of Raffles Seychelles, the Pure Pearl Indulgence treatment is unique to this bijou archipelago and is a tribute to the Indian Ocean Pearl Farms located near the resort. This luxury experience includes a 90-minute treatment consisting of a Pure Pearl body exfoliating scrub, followed by an aromatic shower, a full body application of exotic essential oils and finishes up with a Hydrating Kerstin Florian Facial. Raffles Hotels & Resorts is a luxury brand with an illustrious history dating back to 1887 when the world-renowned Raffles hotel first opened its doors in Singapore. Today, the remarkable collection includes twelve extraordinary properties in many of the world’s best cities and top holiday destinations including favourites such as Paris, Istanbul, and the Seychelles. Many more exciting locations are also on the horizon with new hotels being developed in destinations such as Warsaw and Jeddah. Whether it’s a secluded resort or a lively city-centre, each Raffles promises an oasis of calm and charm and a compelling mix of cultures and styles, and has its very own story to tell. Part of AccorHotels, a world-leading travel & lifestyle group and digital innovator offering unique experiences in more than 4,000 hotels, resorts and residences around the globe, Raffles is proud to draw on the timeless essence of Raffles – to deliver thoughtful, personal and discreet service to well-travelled guests. For more information or reservations, please visit raffles.com.